On November 28, 2012, the Ford Foundation brought together LGBT leaders and allies, artists, journalists, technologists, policymakers and funders to explore the next opportunities for progress for the LGBT movement, how social justice can be inclusive of sexual orientation and gender identity, and how to engage broad communities in securing rights for LGBT people. Securing equality for lesbian, gay, bisexual and transgender people is the civil and human rights cause of our generation. 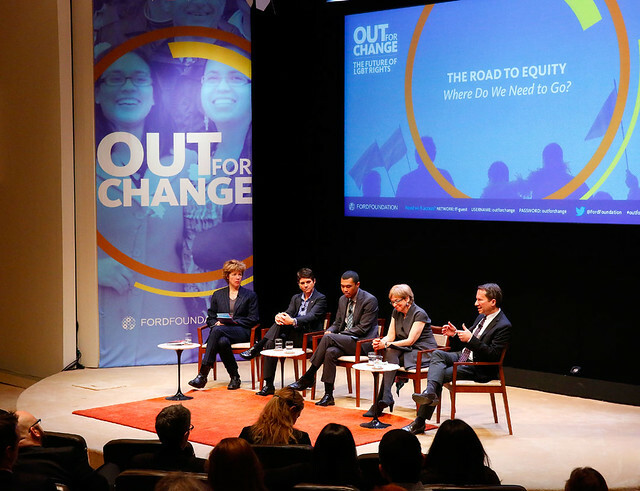 On Nov. 28, the Ford Foundation's Out for Change event presents some unique perspectives from the LGBT community. Individuals, couples and families from across the United States share their stories of struggle, inclusion and hope. Scroll down for more videos from this event. The Culture Curve: Is Culture Ahead of Us or Behind Us? Dustin Lance Black and Kenji Yoshino. 2013. This image is not available under the 4.0 Creative Commons license. 2013. This image is not available under the 4.0 Creative Commons license. Betty Special Performance. 2013. This image is not available under the 4.0 Creative Commons license. Carvens Lissaint and Ceez Liive Special Performance. 2013. This image is not available under the 4.0 Creative Commons license. The Culture Curve Panelists. 2013. This image is not available under the 4.0 Creative Commons license. The Highlights. 2013. This image is not available under the 4.0 Creative Commons license. The Road to Equity Panelists. 2013. This image is not available under the 4.0 Creative Commons license. Welcome Remarks by Luis Ubiñas. 2013. This image is not available under the 4.0 Creative Commons license. Who's In Who's Out Panelists. 2013. This image is not available under the 4.0 Creative Commons license.